Internet dating isn’t new but more people than ever are now registering to find love online and there are a seemingly endless number of sites to sign up to – from free to paid sites, and general sites to interest-specific sites. Internet dating is most definitely NOT something that’s just for computer geeks or losers who can’t find love. In many ways, it’s like meeting someone in a bar or being introduced through a friend. Looking for love online has lost much of its stigma in this technology-savvy age and most people accept that online dating is a fun and often focused way to meet new people. Rather than signing up to the first internet dating site you come across, it’s a good idea to have a proper look around a few and also see what others recommend. The format, type of people registered, price and method vary from site to site. Here are just a few of the types of dating site available. Standard dating sites where you register your own details and meet people online. Sites where a friend writes your profile and also suggests dates for you. By all means, trial free dating sites; there’s nothing to lose. However, it’s worth noting that many people find that those who pay for a dating site are more serious about finding a partner. Paid-for sites cost anything from £10 to £30+ per month. 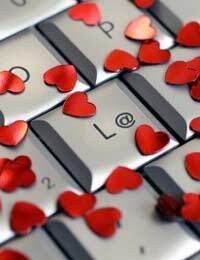 Once you have registered on a dating site, you can view the profile of hundreds or even thousands of others. You can narrow down the profiles in a number of ways such as by age, region or interests, or through a combination of these things. If you like the look of someone, you can send them a direct message (like an email but through the dating site’s messaging system). On some sites you can also see who is online and instant message them. As well as messaging, you can sometimes also send a “wink” or a “flirt” instead which lets someone know you’re interested without you having to actually ‘say’ anything. This will often prompt someone to wink or flirt back or to send you a message. If someone sends you a message, you don’t have to respond but many potential couples exchange a few messages before deciding whether to meet up. The vast majority of people you’ll meet through online dating sites are looking for love and companionship just like you, but don’t take any chances with your personal safety. When you go on a date with someone online (even if you have chatted with them through the internet), take all the normal precautions you would when meeting someone unfamiliar. With all this information in mind, if you do decide to give internet dating a try, don’t forget to have fun!